Lindsay Webster attempts the final obstacle of the 2017 Spartan Race World Championship on Saturday, Sept. 30. Webster took home first place out of the womenâs division. Thousands of the top Spartan athletes from around the globe returned to Squaw Valley Alpine Meadows last weekend to battle it out for one of the most prestigious titles in all of obstacle course racing, the 2017 Spartan Race World Championship. Nearly 10,000 competitors would race into the thin air at Squaw on Saturday, Sept. 30, and Sunday, Oct. 1, completing dozens of obstacles over roughly 16 miles of mountainside course in one of the toughest Spartan Championship races ever put together. “We doubled up on a couple of obstacles, like our harder ones — the bucket brigade, the sandbag carry, the Hercules Hoist. We took some of our staple ones and made them longer and more challenging. We’re high on the obstacle count, high on the mileage, high on the elevation gain, so it’s basically tough all around,” said Vice President of Production Michael Morris. Many athletes would succumb to the course during the day, either from the cold temperatures brought on by the 45-degree swim near Squaw’s High Camp, or from exhaustion. 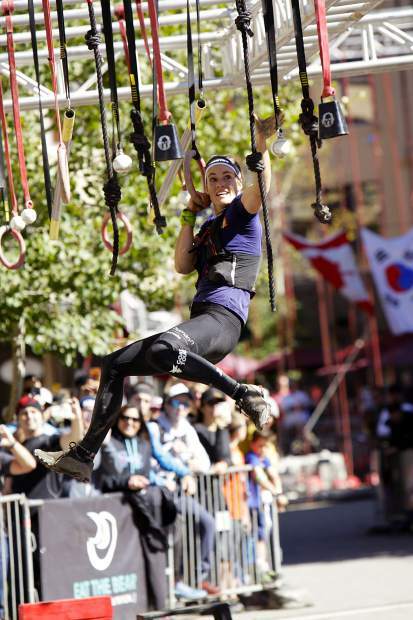 However, one athlete — Cody Moat, 39 of Fillmore, Utah, — outlasted the field of nearly 500 elite athletes to take first place on the Beast Course with a time of 2 hours, 32 minutes, 34 seconds to capture the first-place prize of $15,000. Moat, who is a former USA Track & Field national trail running champion, won the race in his first attempt in 2012, but hadn’t found the magic to recreate that performance over his past four attempts. “The first time, I didn’t really know what it really meant, but to win here after four years of being so close, just made it that much more sweet,” he said. In order to qualify for the race, athletes had to have finished in the top five at Spartan races around the United States and Canada, or take a top 10 finish in an event outside the U.S. and Canada. This year’s elite race brought in athletes from more than 30 countries. The event marked the third consecutive year the championship has been held at Squaw with this year’s race adding more varied terrain, and extra obstacles to the course. Moat and Robert Killian, 35, of Longmont, Colo., battled it out over the first 12 miles of the course until they reached the final climb, which is where Moat took over. From there, the racers made their way to the Hercules Hoist, where athletes hoisted weighted bags high in the air via rope and pulley. The competitors then hit the final obstacle — a series of rings, ropes, and bars they had to swing across to ring a bell. A fall meant a time consuming, and leg and arm burning 30 burpees before the racers were allowed to cross the finish line. Moat was able to reach the finish line first, followed by Jonathan Albon, 28, of Norway. Killian was third. Multi-time winner and legend in obstacle course racing, Hobie Call, 40, made what may be his final appearance in the championship event, taking home a seventh-place finish, and first place out of the master’s division. More than 30 minutes after Moat crossed the line, Lindsay Webster, 28, of Caledon, Canada, made her way across the finish with a time of 3:06:10 for first place and $15,000. Webster reached the final obstacle with a decent lead on second place, Zuzan Kocumov, 38, or the Czech Republic, only to falter and be forced to do burpees. Kocumov reached the final obstacle wile Webster was still doing burpees, giving her a chance at stealing first place. Unfortunately, an exhausted Kocumov was also unable to complete the final challenge, falling to the ground, and ending her race with 30 burpees before finishing with a time of 3:07:53 for second place. Alyssa Hawley, 27, of Spokane, Wash., was the third place female with a time of 3:15:19. While the field of racers made this one of the most competitive world championships ever, according to Spartan Race, many qualifying athletes were there simply to experience the championship caliber event. Chandler Sommerfeldt, 25, of Lake Zurich, Ill., made the trip to Tahoe for her second world championship race. Sommerfeldt said she qualified for the championship after competing in Ohio. Sommerfeldt would complete the course with a time of 5:04:42. Many of the top runners continued to compete the following day in the inaugural World Team Challenge. International squads picked three competitors, representing 27 countries for the race. Killian led team USA to a first-place finish with a time of 1:37:00. Alyssa Hawley and Ryan Woods were also on team USA. The Czech team took second, followed by team Canada in third. For complete results visit Spartan.com.